MAINE STATE POLICE AND POLICE AGENCIES IN YORK COUNTY, MAINE HAVE JOINED THE SEARCH FOR AN ESCAPED PRISONER FROM THE CARROLL COUNTY JAIL IN OSSIPEE. LT. MIKE SANTUCCIO OF THE CARROLL COUNTY SHERIFF’S OFFICE SAYS HIS OFFICE AND NUMEROUS LAW ENFORCEMENT AGENCIES FROM NEW HAMPSHIRE – INCLUDING STATE POLICE – AND POLICE OFFICERS FROM EFFINGHAM, OSSIPEE, TAMWORTH, TUFTONBORO AND WAKEFIELD – RESPONDED THURSDAY SHORTLY AFTER 2:15 P.M. TO A REPORT THAT 33-YEAR-OLD DAVID GLENN HOBSON HAD ESCAPED FROM THE JAIL. A CARROLL COUNTY SHERIFF’S OFFICE DISPATCHER SAID HOBSON WAS STILL AT LARGE FRIDAY MORNING. HOBSON WAS BELIEVED TO BE WEARING A GRAY SWEAT SHIRT AND GRAY SWEAT PANTS. SANTUCCIO SAYS HE WAS BEING HELD AT THE JAIL AWAITING TRIAL ON A BURGLARY CHARGE. MAINE DEPT. OF PUBLIC SAFETY SPOKESMAN STEVE MCCAUSLAND SAYS HOBSON APPARENTLY CRAWLED OVER THE JAIL’S RAZOR WIRE FENCE. IT’S BELIEVED HE CUT HIMSELF ON THE FENCE DURING THE ESCAPE. HOBSON – WHO IS FROM ALFRED, MAINE – HAD BEEN TRANSFERRED IN THE PAST FEW MONTHS TO THE JAIL IN OSSIPEE FROM A JAIL IN WINDHAM, MAINE. 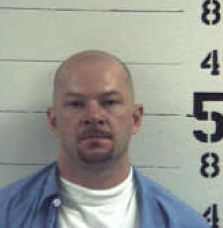 HE’S DESCRIBED AS 5 FEET SIX INCHES TALL, WEIGHS 135 POUNDS AND HAS A SHAVED HEAD WITH A GOATEE. MCCAUSLAND SAYS HOBSON IS CONSIDERED DANGEROUS. ANYONE WHO SEES HIM IS ASKED TO CALL POLICE IN NEW HAMPSHIRE OR MAINE.